Combine the sugar, 2 cups water, the ginger and vanilla seeds and pod in a saucepan. Use a vegetable peeler to remove wide strips of zest from the lemon and 1 orange, add to the saucepan and bring to a boil over medium-high heat. Reduce the heat and simmer 5 minutes. Refrigerate until cold. Meanwhile, peel the remaining oranges with a paring knife, cutting along the natural curve of the fruit. Hold an orange over a large bowl and cut along both sides of each membrane to free the segments, letting them fall into the bowl. Squeeze each empty membrane to release the juices. Repeat with the remaining oranges. 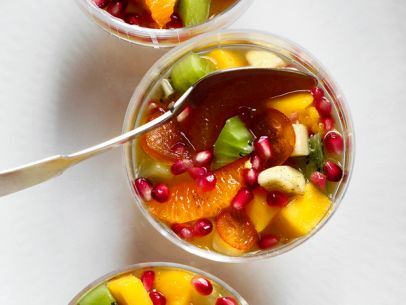 Add the mangoes, bananas, kiwis, kumquats and pomegranate seeds and gently toss. Pour the syrup over the fruit and chill overnight. Before serving, remove the citrus zest, ginger and vanilla pod. Spoon the fruit and syrup into bowls. To remove pomegranate seeds, cut the fruit into quarters, then break apart in a bowl of water. Skim off the pith that floats to the top and drain the seeds.